Necessity: The mother of invention, or, of tonight’s dinner. Lots of the meals I make are driven by what do I have on hand at the moment. Maybe the dinner I imagined and planned and shopped for is losing it’s luster in my mind, or it’s the end of the week and I’ve cooked through my list, but dinner’s still got to be made for that night with whatever I have on hand. I wrote about cooking from your intuition for The Girl Who Knows earlier this month, talking about how to really listen to that to guide you to create meals. After I wrote it, I realized that cook from my intuition and ask myself, “What if I put these things together?” more often than I thought. 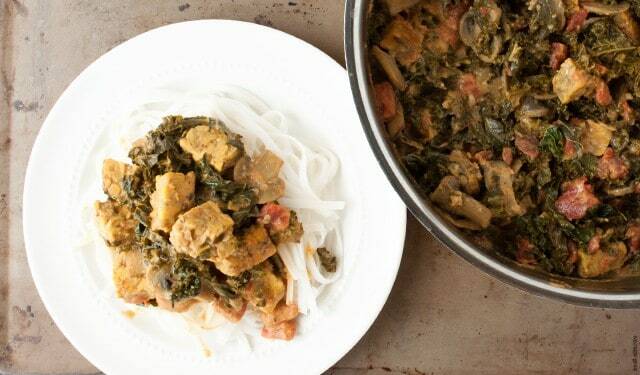 This meal, Vegetarian Curry with Tempeh, is a prime example. When I first made this, it was towards the end of week and I had some random ingredients left over in my pantry from the week and from overbuying ingredients for a party I had had that previous weekend. I wanted something warm and comforting, and curry is always my answer to that need. 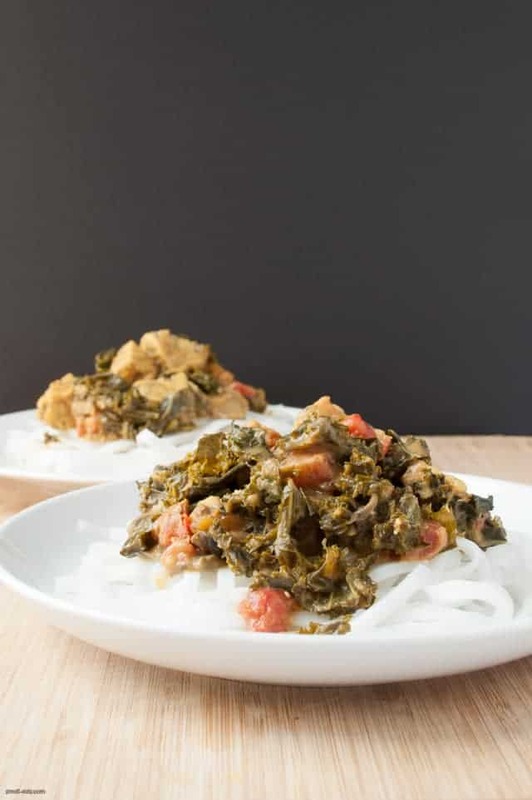 The main ingredients are not your immediate go-to curry ingredients at all: mushrooms, kale, and tempeh. But I was curious what it would taste like. And sometimes the “Why not?” attitude with cooking can lead to delicious discoveries and create a new dish to bring into your weekly rotation. I added some rice noodles to mix it up from the regular rice side and I also had a package in my pantry. You can decide which one you want to enjoy it with. Not feeling tempeh? Swap it out with an extra firm tofu or meat (you’ll need to extend the cook time of the dish to get your meat cooked, if you add in raw). You can make this curry to my instruction or you too can poke around in your fridge and pantry and see what you have, what you would be curious in experimenting with and finding out what works together. There are a lot of cookbooks dedicated to telling you how to put flavors together, but isn’t just trying it yourself a lot more fun? Bring water to boil in a kettle. In a large mixing bowl, add the rice noodles in and cover with the boiling water and any additional warm water to fully immerse the noodles. Let sit until al-dente or your taste for noodles, at least 15-20 minutes, then drain. Bring a sauté pan to medium heat and add in coconut oil. Once hot, add in garlic and ginger and cook for 1 minute, then add in mushrooms and cook until soft and the mushrooms have browned. Add in spices and coconut milk and stir to combine. Add in kale and wilt for 5-8 minutes. add in tempeh and mix thoroughly, then cover and reduce heat to medium low and cook for 10-15 minutes. Taste and adjust seasonings as needed, add water if you want a saucier curry. Remove from heat and serve over noodles to enjoy.